A stunning gi that has solid durability and a solid value. A quality buy that you shouldn’t second guess if you love the design. The beautifully designed Aurora by Fight Aesthetic (seemingly also known as just “Aesthetic”) is quite innovative in its assymetrical design that makes the Gi really stand out compared to other Gi’s. The Gi has what appears to me as the same exact weave as the Shoyoroll Rio Koi, which I know as “Lite Tech” Weave but they call “Hybrid”. It is extremely soft and light. If you’re a fan of the Koi then this Gi is a must have for your Gi rotation. I could probably fall asleep in this Gi, it’s that comfortable. As previously mentioned the Gi is quite light and comfortable, definitely one of the more relaxing Gi’s to wear. The Gi has a very similar cut to Omega Maniacs Shaka and Shoyoroll tops I own, very form fitting but definitely not restrictive, just the way I like it. The sunburst design is very eye catching and the yellow collar piping makes the Gi look very clean. The collar is wrapped in ripstop and is of average thickness. I would say the cuff is around average in gap size, but leaning towards the smaller side. The inside of the cuff is lined with a unique three layer seam tape, with no scratchiness experienced. Kanji is located on the wearers right sleeve and on the right side of the skirt. No shoddy stitching or quirky embroidery on the top whatsoever. The Gi is reinforced at all of the normal locations, the inner armpit and the skirt slits. It’s soft, so pretty easy to grab, but it’s like wearing pajamas. A delight indeed, the Aurora comes with two pairs of pants. Ripstop and Cotton. I’m not the biggest fan of Ripstop and generally like Cotton much more, hence I have a preference to the Cotton (Unlike our good friend Meerkatsu, who also review this Gi). I had no issues while rolling and experienced no saggy crotch syndrome. As you can see, the ripstop pants have contrast stitching on the knee reinforcements and the cotton pants do not, but still has the reinforcements as well. The pants are slimmer in the thigh area than a lot of gi’s without sacrificing maneuverability, they do end a bit wider than a lot of other Gi’s I own but it’s probably something most people won’t notice. 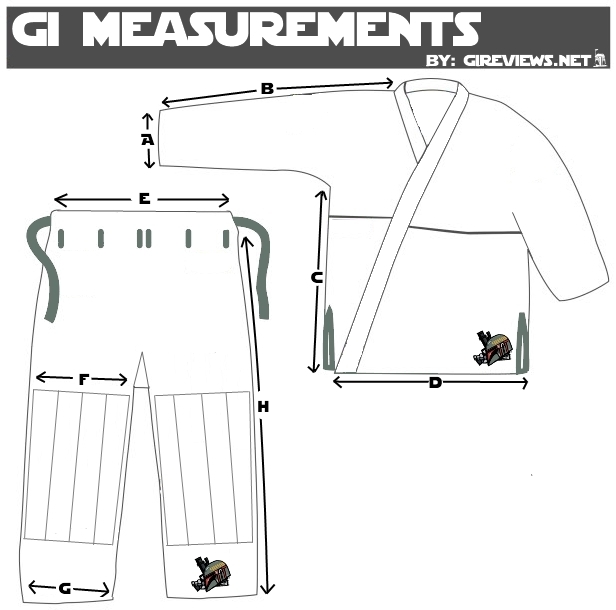 One of the only faults with the Gi itself can be seen in this picture, showing one of the labels on the pants upside-down. Luckily it’s not a very visible outside logo so they don’t lose too many points here. It didn’t happen on the ripstop pants. Aesthetic was ADAMANT about me returning the pants free of charge for a new pair but I refused because it’s not something noticeable as it’s at the waist line and I didn’t want to give up the pants for any amount of time. The belt system, using a cord and six belt loops worked great and the pants weren’t excessively baggy in the waist which is something of a pet peeve of mine. (I’m looking at you Shoyoroll). The crotch is reinforced with the same type of weave as the top for extra strength. And the pant cuffs have the same three layer seam tape as the wrist cuffs. I thought the box that the Gi came in was very neat. It had a wax seal on it that gave the Gi a very luxurious vibe to it. I would have preferred something more tangible like a Gi bag, but I’d say an extra pair of pants makes up for that significantly to most people. Aesthetic showed extremely good customer care qualities in my dealings with them, I have no doubt they would take care of any issue to leave their customers 100% satisfied. Knowing a company will take care of you when making such a large investment like a BJJ Gi means a lot to the average buyer, choosing the company you buy from can sometimes be much more important than the Gi you buy. At 104.99 in British Pounds(around $170.00 US) it’s not a bad deal with the second pair of pants.